As John Roberts and John Boehner drop the axe, students build new fronts against racism and austerity. E-mail questions, tips or proposals to studentmovement@thenation.com. For earlier dispatches, check out posts from January 18, February 1, February 15, March 1, March 15, April 2, April 15, April 26, May 10, May 24, June 7 and June 21. In June, Chicago Public Schools introduced a new per-pupil funding new system in which school budgets will be cut between $200,000 and $4 million. As a response to the massive budget cuts, Chicago Students Organizing to Save Our Schools took action at the June 26 Board of Education meeting. At the end of the two-minute speech, students stood up one by one to speak out against the board. Students were escorted away from the meeting by security guards as audience members chanted in support. CSOSOS is expecting to take a similar action during the next board meeting on July 24. 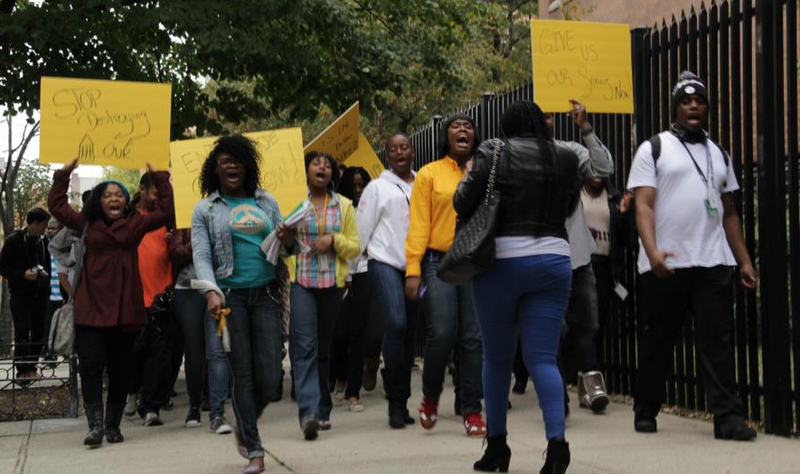 The Medgar Evers College Student Movement originated out of students’ frustration over three years of administrative and fiscal mismanagement. Under President William Pollard, retention declined by 600 students, course options were drastically reduced and class sizes doubled. After a 300-strong walk-outin October and a January letter to Governor Cuomo and Brooklyn elected officials, Pollard resigned. Since then, students have met with elected officials and civil rights activists, ranging from Harry Belafonte to 1199 Purple Gold, to build support for shared governance. In April, CSOME demanded that all twenty-three student representatives remain on the college governance plan—which CUNY leadership unilaterally scrapped. Over the summer, students are campaigning to get 6,000 signatures in support of democracy at Medgar Evers. In California schools, many transgender students aren’t able to get the credits they need to graduate—just because of who they are. Gay-Straight Alliance club activists across the state have been advocating for AB 1266, the School Success and Opportunity Act, to make sure all students have the opportunity to succeed. Last week, the bill passed the state senate, and now heads to Governor Jerry Brown for his signature. If the governor signs, transgender students will be able to participate fully in all school programs and classes. The bill is sponsored by the Gay-Straight Alliance Network, Transgender Law Center, National Center for Lesbian Rights, Equality California and Gender Spectrum. In the weeks leading up to the Supreme Court’s June 24 ruling in Fisher v. The University of Texas at Austin, students from We Support UTlaunched a social media campaign in support of the university’s usage of holistic admissions policies. In the past year, students from the Asian Desi Pacific Islander American Collective, Students for Equity and Diversity, Black Students Alliance and other groups came together to create WSUT, and have been collaborating with the NAACP, Asian American and Mexican American legal defense and education funds to educate students on the history of affirmative action and its importance in higher education. Now that the case has been remanded to the US Court of Appeals for the Fifth Circuit, WSUT is asking students and community members to join in support for holistic admissions. On July 10, students will host a FisherGoogle Hangout with civil rights allies to answer questions about the history of landmark affirmative action cases and discuss the future of expanding opportunity in higher education. The Supreme Court’s June 25 decision in Shelby Co. v. Holder to strike down Section IV of the Voting Rights Act was a bitter pill for democracy—especially for people of color. Section IV required counties and states with a history of voter disenfranchisement to obtain approval from the Department of Justice before making amends to election laws. Immediately after the ruling, the state of Texas passed its voter ID bill, while other states, including Alabama, Mississippi, North Carolina and South Carolina, are working to implement pending voting laws created before the hearings. The NAACP issued a petition telling Congress to act against the rulings. Last election season, Francis Marion University’s Non Pan-Hellenic Council, College Democrats and NAACP conducted informational seminars and rallies to protest South Carolina’s voter ID Bill. As we await Congress’s response, the organizations will work to educate voters about the Shelbydecision and rally for reinstatement of the full Voting Rights Act. 6. Will the Ed Department Act on Title IX? Under Title IX, students are guaranteed essential civil rights to safe campuses and necessary accommodations in the aftermath of violence. However, forty-one years after this landmark legislation, nearly two in three schools do not fulfill their legal responsibilities. One reason for this continued abuse is that the Department of Education doesn’t levy sanctions against offending schools. The time is ripe for change on our campuses: an unprecedented number of students are filing federal Title IX complaints, and the department’s civil rights office issued a powerful clarification of standards with the 2011 “Dear Colleague” letter. To stop campus violence, though, the Department must back up this strong language with action. ED ACT NOW, a collective of campus survivors and allies, is calling on the Department to enforce anti-violence law with a petition, which will be delivered during a public rally on July 15 in DC. Activists are calling on students and allies across the country to sign the statement and join the DC demonstration. 7. Will “School Safety” Answer to Students? From June 28 to 30, I traveled with a group of Gay-Straight Alliance activists from Los Angeles to Denver to join more than 200 youth and adults for the seventh school-to-prison pipeline ActionCamp, hosted by by the Advancement Project and Denver’s Padres & Jóvenes Unidos with the support of groups like the Dignity in Schools Campaign and Gay-Straight Alliance Network. As I know from my experience in South LA, youth are being pushed out of school and criminalized through the overuse of harsh discipline policies, police and juvenile courts. ActionCamp focused on what we can do in our communities to dismantle the school-to-prison pipeline and ensure that youth of color, youth with disabilities, low-income youth and LGBTQ youth can stay in school and succeed. GSAs have worked against the school-to-prison pipeline by advocating for alternative discipline, like the peer mediation program we support in my high school, John C. Fremont, and by making sure students know they have somewhere to turn. On July 1, the same day federal student loan interest rates doubled due to congressional inaction, the Oregon legislature unanimously passed HB 3472, Pay It Forward, a state-level solution to the student debt crisis. The bill begins the creation of a pilot-program in which students would attend public universities and colleges tuition-free. Instead of relying on loans to pay for college up front, students would pay a small, fixed percentage of their income into a public higher education fund after graduation. The proposal, which came out of a Portland State University class on student debt, eliminates the role of lenders and does not include debt or interest. Frustrated by inaction at the federal level to solve the student debt crisis, and by Oregon’s standing as 45th in the nation for per-student public funding for higher education, students worked with the Oregon Working Families Party and the Oregon Center for Public Policy to create the bill. The pilot program must still get final approval from the legislature in 2015. After meeting with members of the Colorado Student Power Alliance on June 21, Congresswoman Diana DeGette pledged to co-sponsor the Student Loan Fairness Act, SB 1330, which caps federal interest rates for future student loans at 3.4 percent, reduces the public interest repayment to five years, allows borrowers to defer interest during times of unemployment and allows federal consolidation of private loans. Though the legislation doesn’t address the doubling of federal student loan rates that went into effect on July 1 after Congress was unable to reach a deal before the July 4 holiday, it offers a long-term solution to record-breaking levels of student debt. DeGette is the fifty-first sponsor of the bill, which is supported by the NAACPand the US Student Association. In addition to legislative advocacy, COSPA has organized with Jobs with Justice and the Student Labor Action Committee to launch divestment campaigns targeting Wells Fargo, pressure Sallie Mae through direct action and back walk-outs in protest of school privatization. On July 29, protesters stormed the streets of SoHo, New York, joining over thirty-five cities in a national day of actiondemanding corporations sign the Bangladesh fire and safety agreement. Over 1,200 Bangladeshi workers died this past year in factories owned by brands and retailers including GAP, WalMart, H&M and Target. Bangladesh, the world’s second largest garment producer, has over 3,500 factories, where the majority of the four million workers are women, paid less than $37 a month, in an industry that makes over $20 billion annually. More than one hundred protestersfrom 99 Pickets, Desis Rising Up & Moving, United Students Against Sweatshops, NYNJRJB Workers United, the YaYa Network, Student Labor Action Movement, the United Auto Workers and the Rude Mechanical Orchestra picketed around these corporations, disturbing the consumer peace and bringing attention to the need for corporate accountability and consumer awareness.